I have 3 full days in Korea left. It's a very weird feeling. I'm ready to go, I can't wait to see my friends and family at home, be in a place where I understand what's going on and I am very excited for my epic journey home on the train. But I'm already really sad that this adventure is coming to an end. I have a to-do list as long as my arm to get done before I leave next friday, and one of the main things that us expats have to sort out is cleaning out our living spaces. I thought I would share some info that others in this position in Korea might find useful. I have a lot of stuff. I don't really know how I do it, but I am incredibly good at accumulating stuff, lots and lots of it. Since there will be a new teacher moving into my apartment at the end of August, I need to clear it of all of my belongings, leaving only useful household items. Here are 4 ways to get rid of the stuff from your wardrobe in Seoul. I see these everywhere now. I never noticed them before, but I asked a co-teacher where I could donate clothing and she pointed one out. All over the city there are green recycling bins for donated clothing, materials (think duvets/blankets) and you can also give shoes. I promise if you've never noticed them before, you will now see them everywhere! I've counted 5 between my house and the supermarket (a 10 minute walk). Sometimes they're painted grey, but most of the ones I've seen are green. This picture shows the two shapes I've seen as well. Some of them are stamped with a wheelchair. I assume this just means they are collecting for funds to help the disabled. It doesn't make a different to what you donate. 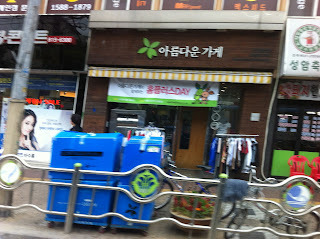 There are a few Salvation Army shops around Seoul. I've never actually been to one but you can look up the locations on this website. I have found another charity shop though, this one closer to me at sindaebang sageori (line 7). This one is on my bus ride home from school. I managed to snap a dodgy picture as the bus flew past. I recommend keeping your eyes peeled when you're out and about for shops that have donation bins outside or perhaps another that looks like this one. This is a good place for anything you need to get rid of that can't go in the green bins. If you don't want to get rid of your stuff, but you can't get it all into your suitcase or you don't want to lug it around if you're travelling after leaving Korea, I suggest shipping it home through the post office. I've so far send 2 parcels and I have at least another one (probably two) that I will send this week. My first parcel has already arrived home. If you ask for shipping, surface mail then it should take about 2 months. I sent my first parcel in May and it arrived at the end of July. The cost is pretty cheap. Both my parcels have weighed about 8kg and they cost 25,000 won to send. You can buy the boxes at the post office, and my advice would be to put the stuff you're sending in a suitcase and wheel it to the post office to pack the parcel there. I wouldn't fancy trying to manoeuvre myself there with my box full up. They have everything you need to secure the box at the Post Office, and if you are lucky like me, there will be a nice security man to help you sellotape it up and sort all the forms you have to fill in too. There is also a flea market in Seoul (sinseol-dong line 1 and 2), where you can get a pitch to sell your stuff. It is free for foreigners to rent a space, but as the market is not that well know to other foreigners you might find it hard to sell stuff. Unless you have things that Koreans would be interested in. I think this is a great idea but it might need some organising. Perhaps arranging with a few friends and getting the word out on facebook would drum up more interest. If you want to know more about the flea market visit the website (in English).